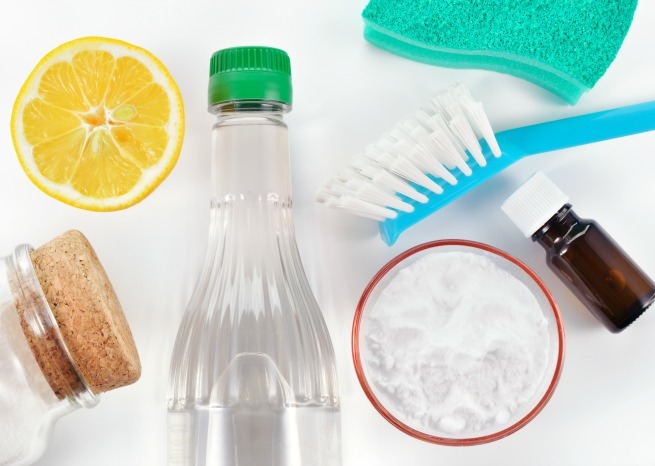 Why make your own cleaning products? Because the ones on the market are bad for you! Many hazards can be found in the average household from things we use every day and don't think twice about. Taking care of a busy home often requires a lot of cleaning up to ensure that the areas you inhabit are as germ-free as possible, keeping your family happy and healthy. But the very things that are meant to protect us from germs and keep our houses spotless are also sometimes the source of further harm to our bodies. Many of the popular cleaning products on the shelves at your local supermarket are full of harmful chemicals that can enter the air and get into your system without you ever realizing it. They have VOCs (volatile organic compounds), which evaporate at room temperature and often make people sick. Products like air masking agents have these — so instead of covering odors up, you can try absorbing odors with things like vinegar and baking soda in a much safer way. We think you shouldn't have to sacrifice the health of you, or your family, by being forced to choose the lesser of two evils. We all like things that smell pretty, but stick to more natural materials rather than with products with VOCs in them. Below we've shared some recipes for green cleaning using many items you're likely to already have somewhere in your pantry or home. They'll help you run a safer household and might even save you some money in the process — and we'd call that a win-win. Combining specific common household ingredients—many of which are food-grade—will also save you money. Remember as with any cleaning agent, test on a small and unobtrusive spot to be sure you are satisfied with the results. Also be sure to use clean, dry containers. Label any jars containing cleaners you will save for another day. Extend the life of any solution containing water by using distilled instead of spring or tap water. Put borax and washing soda in spray bottle. Add 8 oz. hot water. Shake to dissolve. Add liquid soap and essential oils. Leave out washing soda if using on fiberglass—it will scratch. Mix to a paste consistency. Rub on, rinse with water, and dry. Mix. Apply with a soft cloth. 2 parts vegetable or olive oil. Mix to a paste consistency (Add another ½ Tablespoon water if necessary). Pour equal amounts of distilled white vinegar and water in a spray bottle. Wipe dry with crumpled newspaper, a lint-free soft cloth, or use a squeegee. For rinsing produce and killing germs on food preparation surfaces. Add distilled white vinegar to a spray bottle. Add hydrogen peroxide (standard 3% drug store strength) to a separate spray bottle. Spray one then the other. Which one comes first does not matter. Be sure to keep them in separate bottles. These each kill Salmonella, E. coli and other pathogens. According to the USDA’s Agricultural Research Service the combination of the two increases the effectiveness, killing 99.99% of Salmonella on apple slices.